The First Minister Nicola Sturgeon took part in a question and answer session with a panel of business leaders to discuss plans to give everyone the same chance of success in life – whatever their gender. The event was the backdrop for the launch of “50:50 by 2020”, a voluntary scheme to encourage gender balance in the boardrooms of public, private and Third Sector organisations over the next five years. The panel discussion was held at Edinburgh Napier University’s Craiglockhart Campus and involved speakers from the public and private sectors in Scotland talking about their personal experiences and their hopes for diversity in boards. The panel featured Elaine Maddison, Alliance Trust Savings, Andrew Watson, Quorum Network Resources; Kate Macgregor, Virgin Money, Jonathan Gould from The Gate Interactive and was chaired by Professor Andrea Nolan of Edinburgh Napier University. The First Minister spoke about removing the ceiling on ambition and enabling everyone in Scotland to achieve their full potential – and heard the views of ambitious young people. There was a lively discussion with the audience about the barriers some people face in fulfilling their potential. Those who couldn’t attend tweeted questions using #getOnBoards covering subjects from unconscious bias when recruiting and promoting new members to ensuring women return to work in male dominated sectors. 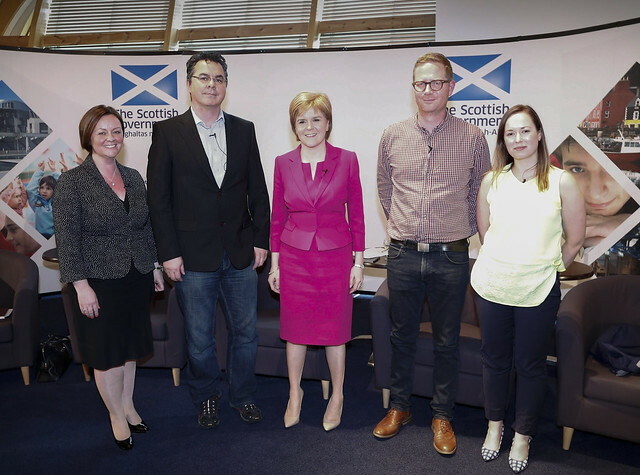 It was a unique opportunity to hear the First Minister and other leading public figures address an issue in which Scotland aspires to lead the way worldwide.